A 1 mm regular dermaroller. If you have frown lines in between the eyebrows (the "11's"), buy our single needles. From our experience, these lines respond excellently to targeted single needling. Pycnogenol has a mild anti-inflammatory effect but there is no problem taking it in combination with dermarolling. The only case I have heard of so far was a customer who applied a cream with silver nano-particles and it very substantially reduced the redness after microneedling comparing to when she did not apply it. In her case, I advised her not to apply it right after microneedling. You bought it July 16, 2012, together with a 1.5 mm roller and some other items. It is definitely time to replace it. . When this happens with a new roller we replace it free of charge. The bottle is airtight (on purpose) and this can some rare cases cause this. Please contact martina AT owndoc DOT com and she will arrange a replacement. Dermarolling / Microneedling / Re: exfoliating everyday while using the dermaroller ? It is not really necessary but by adding a more targeted microneedling instrument that costs a mere 15 dollars, you increase the likelihood of significant improvement. Stretch marks are not "marks" - they are in fact very deep scars. From our experience, stretch marks need a combination of a dermaroller and a more targeted dermaneedling instrument (a dermastamp or the single needle). Do not exfoliate with a loofah, it is unhygienic. Exfoliate with fine salt in the shower. If you get scabs from stamping/needling, do not exfoliate at all until the scabs will fall off naturally. Do not forcefully remove the scabs – it can lead to scarring. Daily exfoliation is too often. Twice or three times a week is more than enough. Do not exfoliate if the skin is still "raw" from rolling or needling. The cream is OK, especially if it does not break you out and it is a little heavier cream than a light moisturizer. >After reading the forums i keep hearing of the numbing cream is this needed before stamping? Some of our customers use a numbing cream and some don't. From my own experience with dermarolling, I do not need a numbing cream except in the area above the lips. A dermastamp is less painful than a dermaroller. 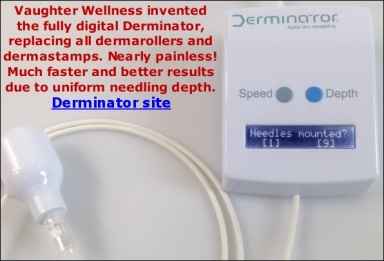 The reason why a dermaroller is perceived as more painful is because it makes many more pricks per unit of time than a dermastamp does. For example, in one second, you insert the dermastamp (that has 35 needles) in and out the skin only once - this is 35 pricks in the skin per second. A dermaroller is rolled approximately once around its axis during one second - which means 180 pricks per second. 180 compared to 35 pricks a second is a big difference in pain level. I have used a 1.5 mm dermastamp many times on my face and my pain threshold is not very high in general but I think a 1.5 mm dermastamp is totally bearable and I would not use a numbing cream. This is of course individual. In your case, do not buy Tretinoin cream because your acne is already under control and your skin does not need more peeling. You have to keep the treated area moisturized with a cream that you know from your experience does not break you out. You could buy our vit. C powder to make the serum and apply it at least three times a week because vit. C is necessary for collagen production. Dermarolling / Microneedling / Re: Help: Too much ret-a used??? That's bad and I'm sorry it happened! That being said, we warn against the over-use of Tretinoin in many places on our site. . In the description of the product in our shop, we say that a pea size amount of cream is enough for the entire face and that the skin may start peeling. "Only a pea-size amount of gel should be used to spread on the entire face. Using more may cause irritation and redness. Tretinoin will likely make your skin peel. " A downloadable leaflet in the support section on our site about the cream also explains how to use it. I understand that you did not want to waste the cream but concerning Tretinoin, the more is not the better. The redness and peeling are only temporary and it will go away. Take a cotton pad, sprinkle it with tap water, add some oil and apply it regularly on your face. This may slightly diminish peeling. Yes, you can wear makeup but you must apply something very moisturizing under the make up to avoid the drying out of the makeup. Don't worry. Infadolan is semi-occlusive. The wax will stay on the surface and form a barrier that will prevent water evaporation. It is not going to sink in, not even after microneedling. It is intended for skin with an impaired barrier due to burns, eczemas, diaper rash, non-infected injuries, decubitus ulcers etc. It helps re-epithelialization. Did you undergo dermabrasion or a deep peel? It seems that your outermost skin layer is somehow abraded on part of your cheek. For the time being, buy just a 1.5 mm dermastamp with 35 needles and stamp every three weeks your raised post scab scars and your other scars that are indented. If you manage to improve your biggest scars, the overall texture will look much better. Use the 1.5 mm dermastamp on your laugh lines as well. Scabs should never be prematurely removed because this can leave scarring. Dermarolling / Microneedling / Re: Derma Single Needle Question! Please read this forum thread. If you still have questions after reading it, just ask. Dermarolling / Microneedling / Re: Age to start for aging prevention/dermarolling with urticaria pigmentosa? if I'm already going to be using 1.5 mm on stretchmarks, should I just go ahead and use it on my neck/etc for prevention? Your case is specific due to your condition so you should only start using dermarollers after a long time of using a dermastamp and when you are absolutely sure microneedling does not worsen your condition. You could try hydroquinone cream for your Melasma but I am not sure whether it could worsen your urticaria pigmentosa. Tretinoin cream or your Differin should help discolorations. Dermarolling speeds up the turnover of the skin and that helps diminishing pigmentations. Start with a regular 1 mm dermaroller and later you can go for 1.5 mm size. The same for your neck. I have already answered that in my previous posting. Apply oils. Oils are the best moisturizers because they prevent the evaporation of water from the skin. Dry skin is a result of an impaired skin barrier that prevents water evaporation from the skin. Sprinkle a cotton pad with tap water, add almond oil or other oil and apply it on your skin. Ack, I'm sorry, something else occurred to me: I use Differin .3% on my face and that keeps the acne mostly under control. Can I keep using that instead of tretinoin, or should I switch (or use both)? Use Differin. It would be superfluous to use Tretinoin when you have Differin, since it is a similar retinoid. Up to three times a week with a 0.5 mm and every 10 -14 days with a 1 mm size.